Be seen paddling home after watching the sunset from a quiet island. Portable navigation lights are a great solution for small, manually powered watercraft such as dinghies, canoes, rowboats and kayaks. 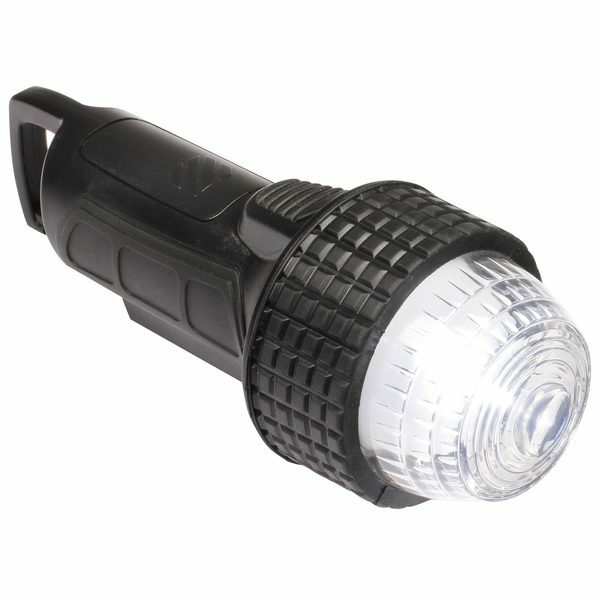 The West Marine portable LED stern light is light weight and quick to deploy. A special projector lens intensifies the long lasting LEDs to increase brightness without increasing power draw from the four AAA batteries (sold separately). The housing of these watertight lights is made of premium plastic and boasts an integral lanyard hook and no-slip rubber grip. Because of its Clear lens, the stern light pulls double duty as a flashlight or spotlight. When used as a navigation light, it can be mounted using included suction cups and C-clamp brackets to free up your hands. Stay out a little longer knowing that you’re prepared for the paddle home with our portable Stern Light Kit.